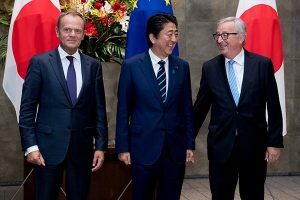 The EU-Japan Economic Partnership Agreement and the revitalisation of the international economic liberal order, Gabriel Felbermayr. ARI 22/2019 – 21/2/2019. The new Economic Partnership Agreement (EPA) between the EU and Japan is the biggest free-trade agreement that the two parties have ever signed. Due to its size it has implications for the rest of the world and for the world trade order. This analysis assesses the prospective magnitude of the EPA and whether it will contribute to revitalise the international liberal economic order.